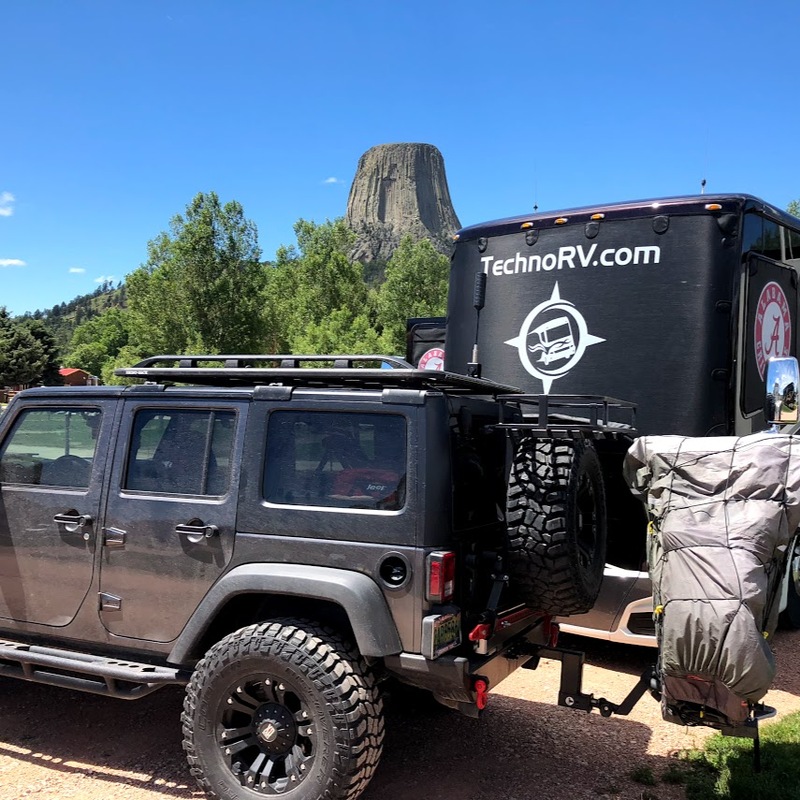 We started the month of July wrapping up our time in North Dakota visiting Devil’s Tower in Wyoming before heading to Theodore Roosevelt National Park in Medora, North Dakota. We only spent a couple of days at Devil’s Tower because there isn’t much to do there except take the trail around the base of the tower. Well, if you really want to live on the edge, you can get a permit to climb the tower, and there were a couple of people doing that while we were there. You can see them if you look REAL close in the 1st picture. 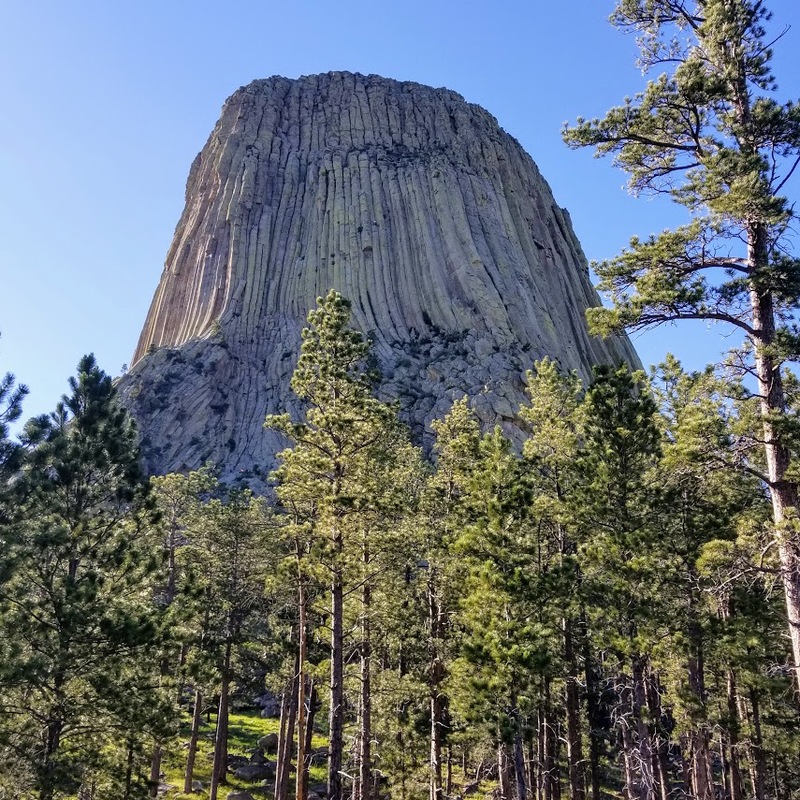 Devil’s Tower is the nation’s first national monument, and we were excited to see it. It was also the site of the movie Close Encounters of the Third Kind, so we rented it the night we were there. Not a movie I’d recommend, but we couldn’t miss the opportunity to see it while camped at the base of the monument. 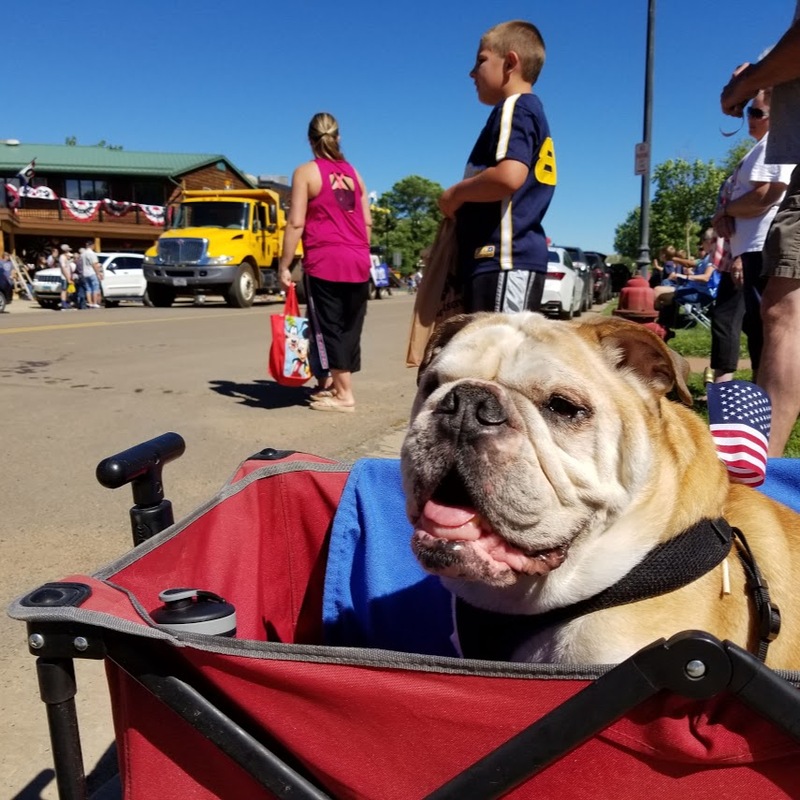 We spent the 4th of July in Medora checking out TR National Park and took Lincoln to the town’s parade. That night, they had fireworks and they were literally right outside our RV. We had the perfect spot to enjoy the view from the comfort of our own RV site. 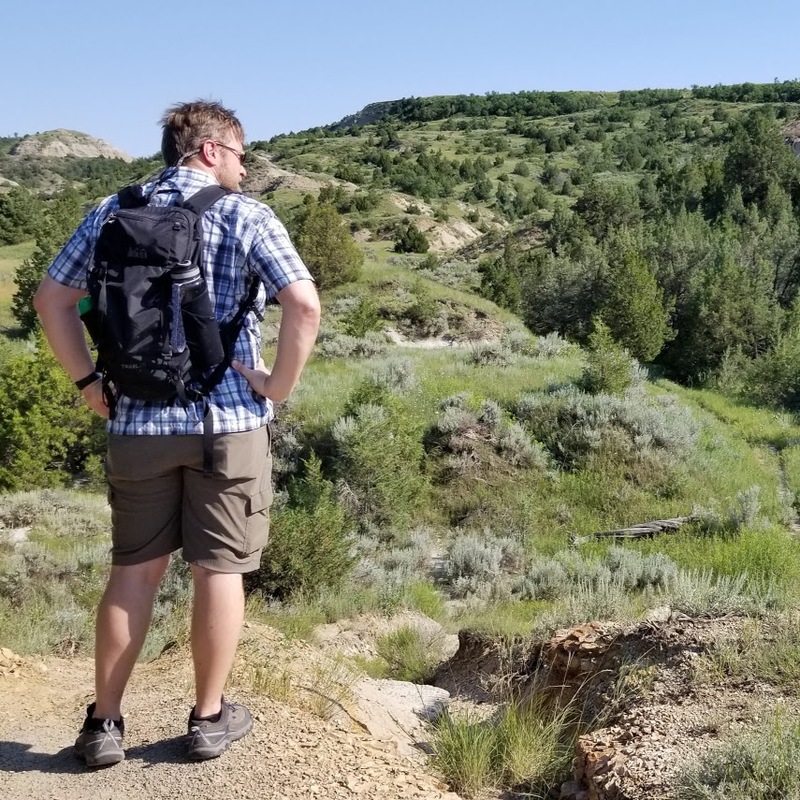 We did a couple of hikes while in the Park, and really enjoyed the area. 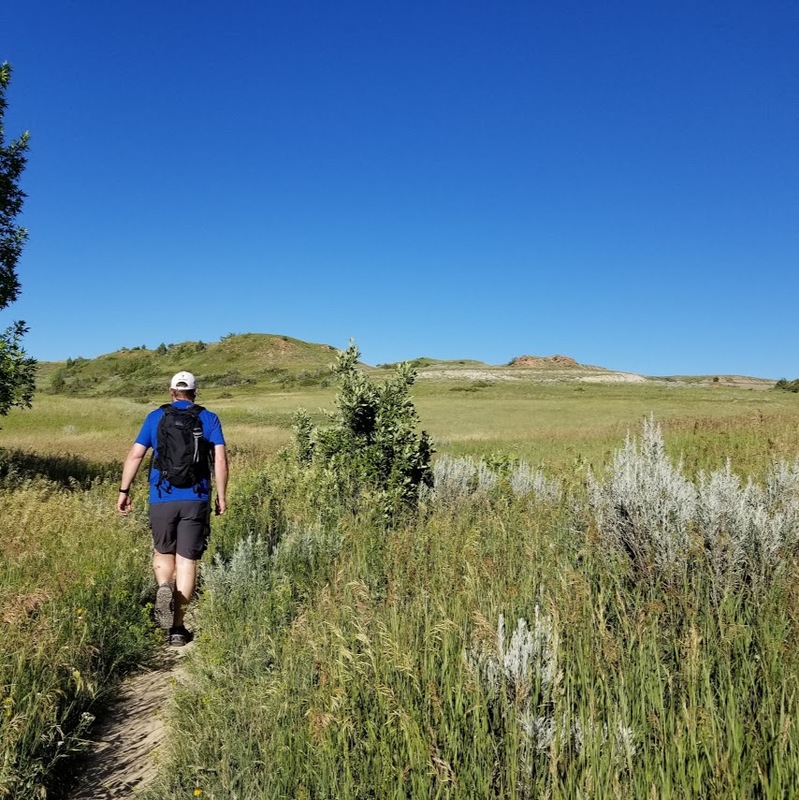 We did the Petrified Forest Loop Trail and Painted Canyon Nature Trail. The Forest Loop Trail was SO remote. You had to sign a log at the trailhead and we were the only ones on the trail. We had to drive 3-4 miles out on this deserted road to even get to the trailhead. It was the most remote trail we’ve ever hiked. We liked this park more than the ones in South Dakota, but we hiked more in this one too. 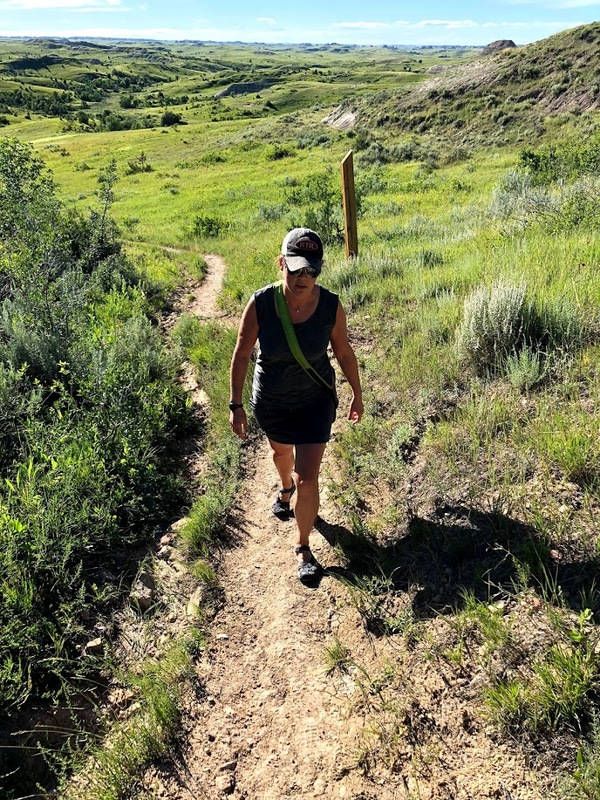 It always works that way – the more we get out and explore in a park, the more we like it. After spending a few weeks in the plains of the Dakotas, we were ready to spend some time on the water! Although we love all of the different places we get to travel, we prefer being around / on the water. It’s one of the main things we miss from our home area in Mobile, Alabama, and we gravitate towards it when planning our travels. During the month of July, we had our fair share of it while exploring the North Shore of Lake Superior. 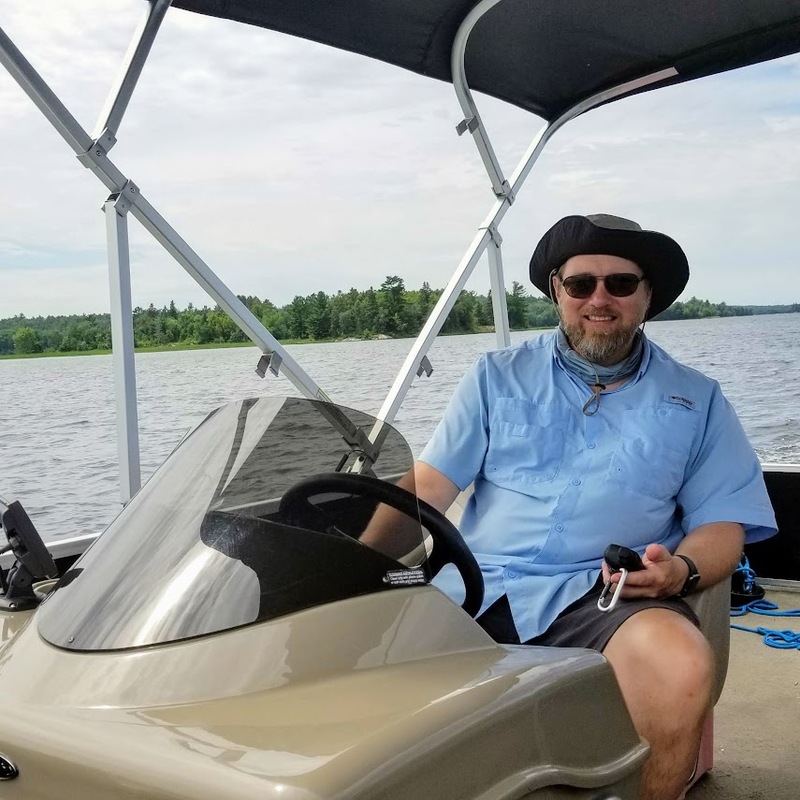 We started our time in Minnesota and were able to visit Grand Marais, Kabetogama, and Duluth while there and were able to stay on/near the water in all 3 locations. 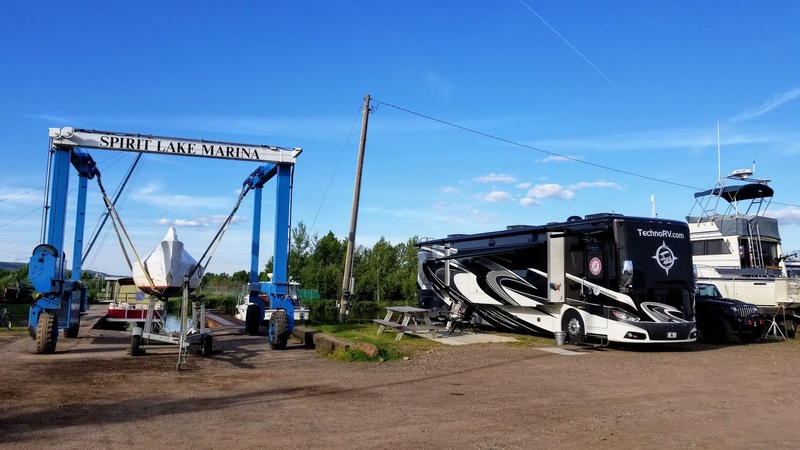 The first stop in our water-filled month was in Grand Marais, Minnesota where we stayed at the Grand Marais Campground/Marina. The city of Grand Marais was wonderful, and we were able to spend a lot of time outside with some wonderful days of weather. We ate the best cheese curds we’ve ever had at a local brewery called Voyageur Brewing Company. The beer was pretty awesome too, and we had a great view of the water from their patio deck….BOTH times we went. 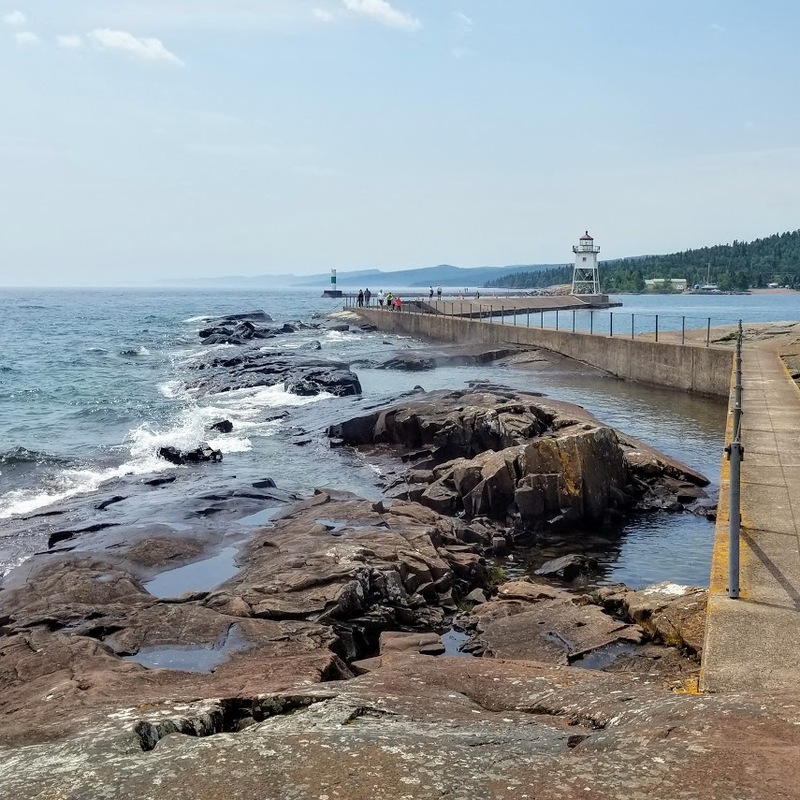 🙂 We spent one day walking the “Island” which connected the Grand Marais Harbor to the East Bay. The path was not like the island we are used to in Mobile; it was all rocky and we had a fun time climbing around to get up close with the water. 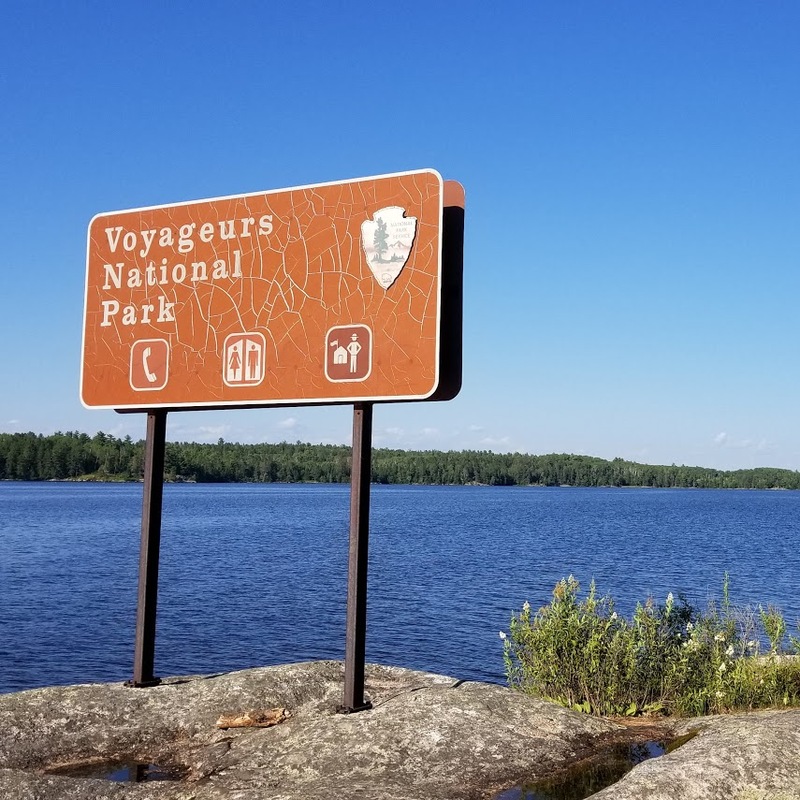 After our time in Grand Marais, we headed to Kabetogama (called “Kab” by the locals) to visit Voyageurs National Park. This was like no other park we’ve visited because the park is actually a peninsula that can only be accessed by water, and the 4 lakes surrounding the peninsula are also part of the park. It was named after the fur traders that “voyaged” the waterways hundreds of years ago. In order to explore the park, we rented a pontoon boat for a day. We took the 20 mile trip to Kettle Falls which is right on the Canadian border. We actually crossed into Canada several times in the boat while maneuvering the waterways to Kettle Falls. The weather was perfect and we had a great time. We stayed at a nice place on the lake called the Pines of Kabetogama and they were a super friendly place. After checking out the park, we headed to Duluth, Minnesota. Now, if you know Eric well, then you know he loves Duluth Trading Company. Something about the whole mountain man thing appeals to him, plus the commercials make him laugh. THAT is the main reason I selected Duluth as a stopping point (sad, I know), but it turned out to be a gorgeous city on Lake Superior. It is located right on the Minnesota Wisconsin line where Lake Superior flows into the St. Louis River. We were able to stay at the Spirit Lake Marina and Campground which is located right on the river. Now this was a real marina, and the campground is not separate from the boats. We were surrounded by boats, both on the water and on the hard. The marina has an interesting history that dated back to WWI was a shipbuilding site. Eric enjoyed the area so much, we actually extended our stay there a couple of days to see one of the boats put into the water. We were able to tour a couple of boats and met some great boaters who were more than happy to talk Eric’s ears off about boating and the Great Loop. The day we arrived in Duluth, they were having an event at Bayfront Festival Park we attended. it was showcasing local businesses from the area, so we were able to learn more about what we may want to do while there. The Duluth Lakewalk and Boardwalk was beautiful! It was a windy day and the waves were crashing, but we enjoyed the time outside. While in Duluth, we also rented a canoe in order to check out the St. Louis River waterways. Man was that work! We found a small beach area (and as a Gulf Coast native, I use that term very loosely) to take a break before heading back to the marina. I’m glad we did it, but we enjoy the pontoon boats better. 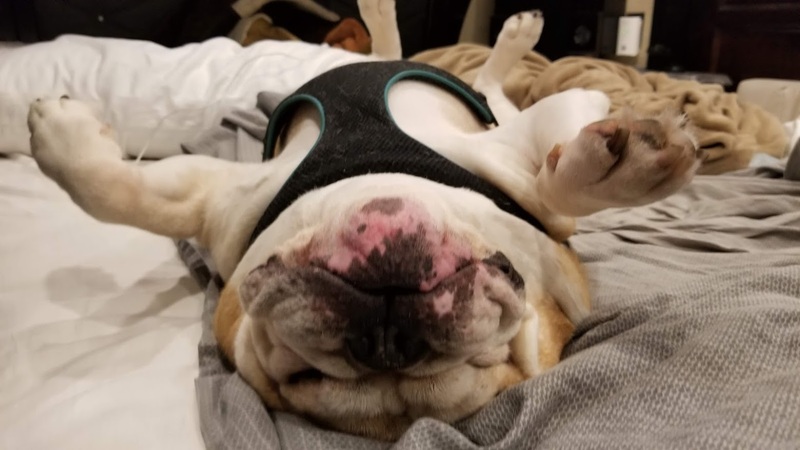 The older we get, the more comfort we (and our backs) want! After our time in Duluth was over (and Eric got to see a couple of boats put in the water), we headed east to Michigan. We spent some time in the U.P. last summer, but didn’t go any further than the Mackinac area. 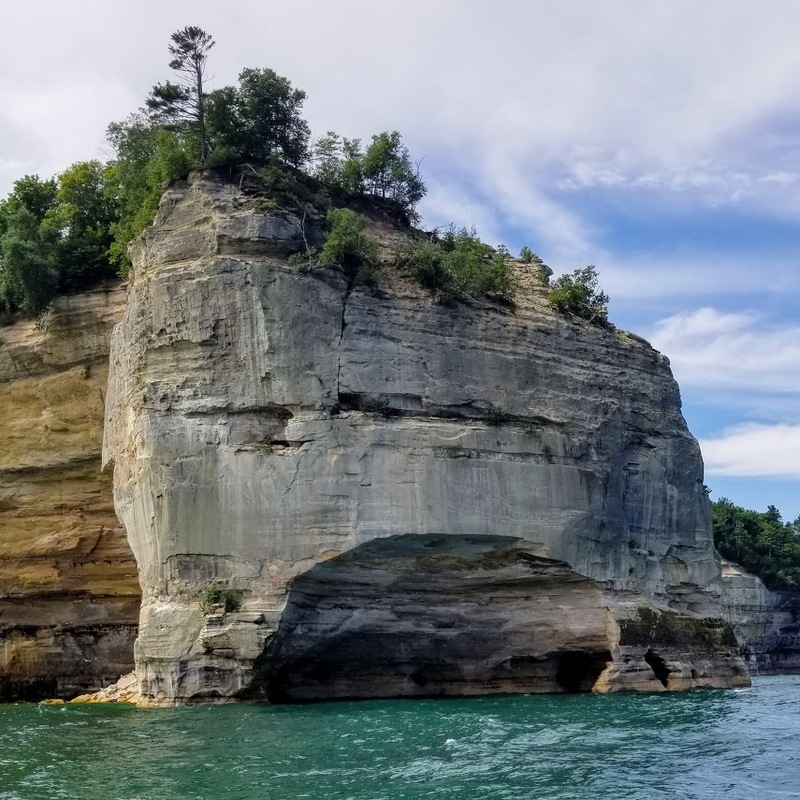 This year we wanted to check out the northern shores and visit Pictured Rocks National Lakeshore. We started our time in Michigan in Houghton County (pronounced Hooten, not Howten like I said it) and stayed at a state park near the water called the Hancock Recreation Area and Beach. 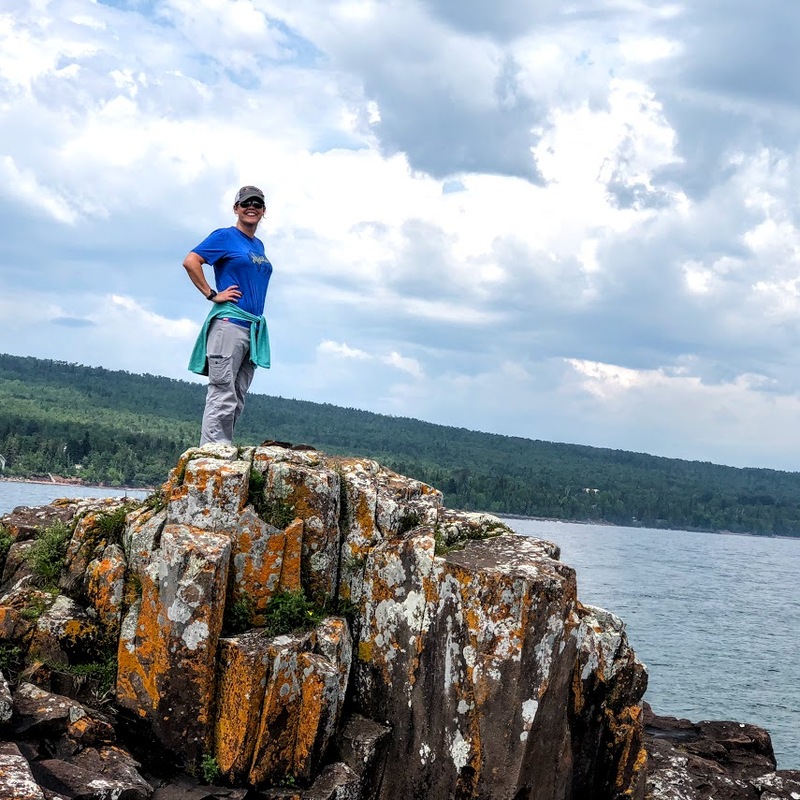 We had considered visiting Isle Royale National Park from there, but the park is an island and the boat ride would be too long to get there and back in one day. With Lincoln, we aren’t able to stay away from the RV more than a 1/2 day or so, so we are putting that park off until later. We did check out the Visitor Center (which was closed) and were able to see the enormous boat they use to transport guests to and from the park. 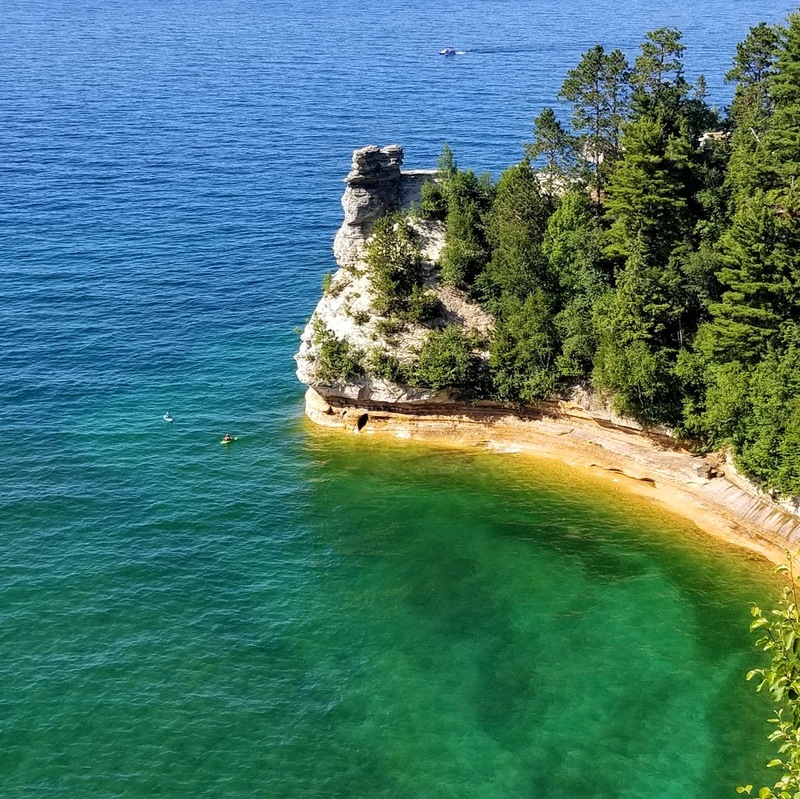 Our second stop in Michigan was one of our favorites: Pictured Rocks in Munising, Michigan. We did several hikes while there, and the area was really pretty from land. We did the hike to the Coves and one hike to Miners Beach. After two days of long hikes, we took a day to relax on Sand Point Beach. 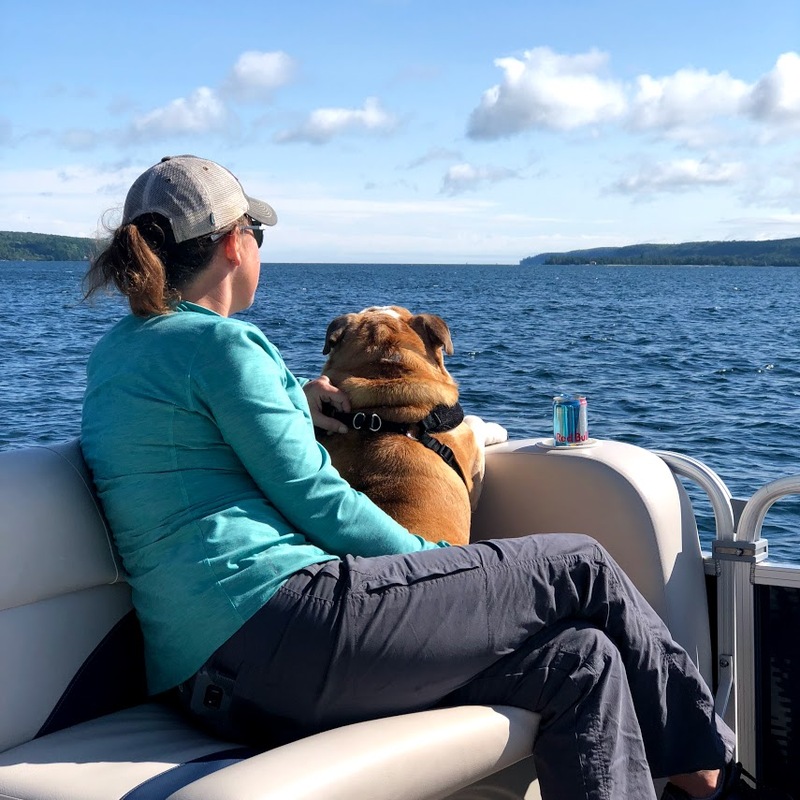 On our final day in Munising, we rented a pontoon to see the lakeshore from the water. It ended up being a chilly day, so we were able to take Lincoln which was great. He always loved our boat when we were in Mobile, and it was nice to be able to let him spend the day with us. Unfortunately, the water was pretty rough in the beginning of the day, and poor Lincoln and I got soaked a couple of times. He didn’t seem to mind near as much as I did. 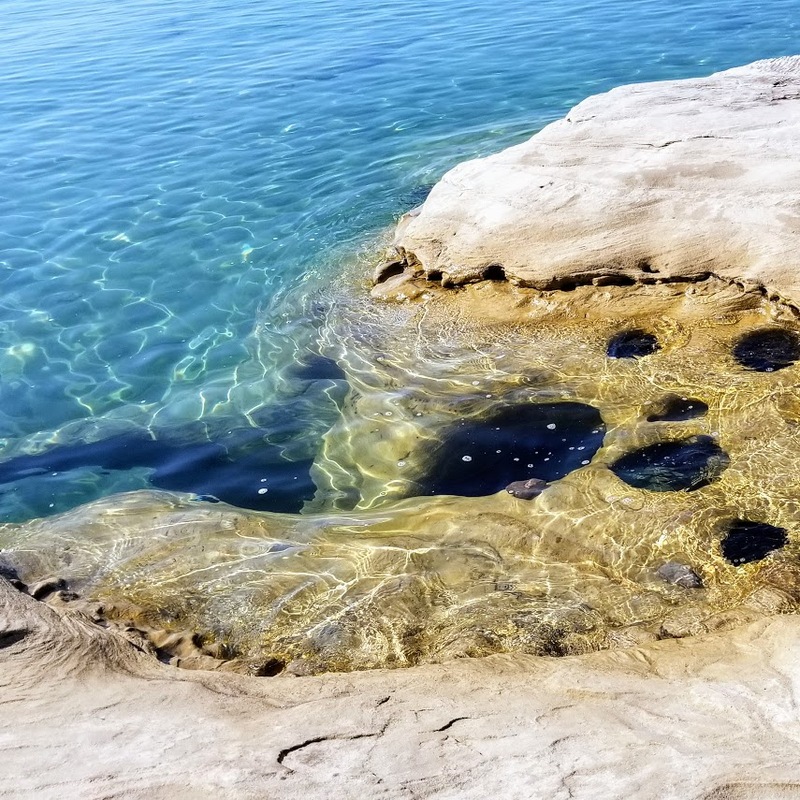 Luckily, when we arrived at Chapel Rock and Beach, the waters calmed down and we were able to relax a little more (and stay dry). The rocks were beautiful from the water, and I would highly recommend renting a boat or taking one of the boat tours if you are in the area. We are expected to be in Goshen, Indiana in August, so we started making our way south after Pictured Rocks. After staying a couple of days in St. Ignace, we crossed the Mackinac Bridge and headed to Petoskey, where I sit today. We are staying in a ridiculously nice resort called Hearthside Grove Motorcoach Resort where we are doing a couple of seminars this week. We have a Tiffin Phaeton, and it is considered a nice motorhome, but it pales in comparison to the motorhomes in this resort. It is filled with Prevost, Newell, and fancy buses. The grounds are incredible, and they have a lot for their residents to do….including learning about WiFi and tire safety from us. 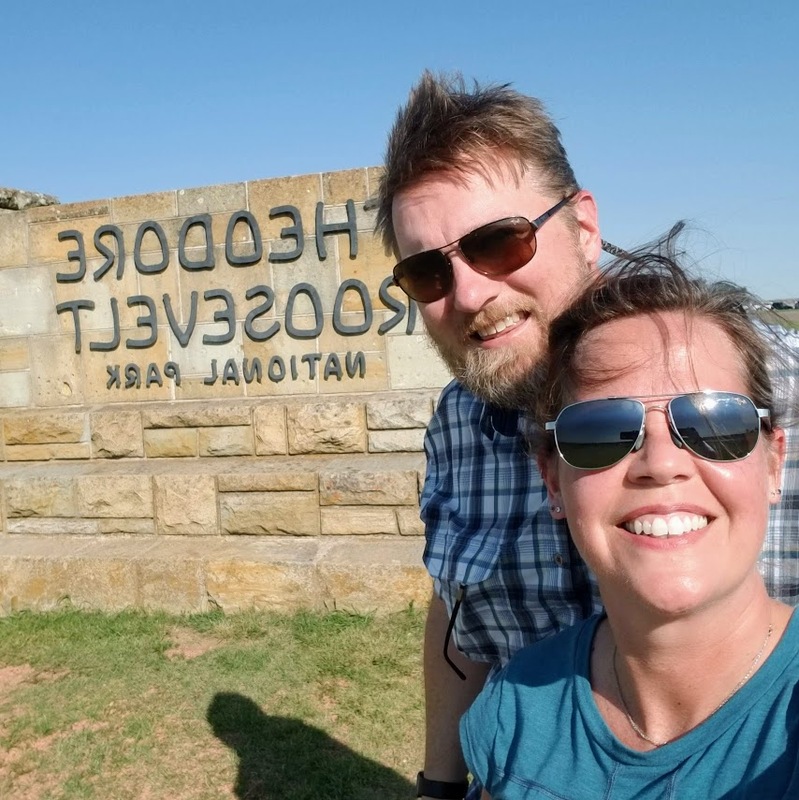 We are trying to be productive this week, but it is difficult with the gorgeous weather and cool places to visit in the area! Not only is Hearthside Grove an incredible resort, but the people who run it are as well. Make sure you visit Kilwin’s HQ in Petoskey.